School days 2013 just started but the back-to-school frenzy hasn’t subsided yet. Just look at the horde of haggling last-minute shoppers searching for quality school items at very affordable prices. The problem, however, for some is that doing so after office hours limits their shopping time. In the end, they’d end up rushing, only to realize that since they were in a hurry, they would buy the wrong item and worse, shell out more money in the process. No need to worry, though. 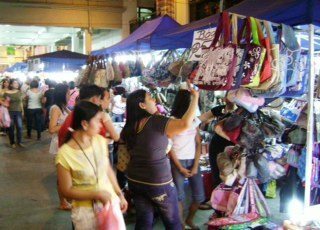 If you want stress-free shopping even after the usual mall hours, like working parents who are busy during the day, there is one place to go to, where shopping hours are extended for those with little or no time to shop during the day—Tutuban Center Night Market. Why the Tutuban Center Night Market, you ask? Though there are still a throng of shoppers wiggling their way through, it’s considerably less than daytime. It’s also more convenient because it is now easier to spot the item you need, plus the fact that the night-time air is significantly cooler. 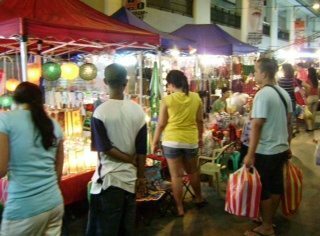 And even if it’s night-time, shopping at Tutuban Center Night Market is safe and secure. Security personnel are constantly roving and on the alert for anything and prepared to respond appropriately, ready to assure the people’s safety even until midnight. Not to mention the CCTV cameras spread throughout the center for your peace of mind when shopping. Have a vehicle? Just leave it at Tutuban Center’s guarded multi-level parking building that can accommodate hundreds of cars to secure your vehicle. And since you’re shopping at a time when you should be having dinner, no worries as well. Tutuban Center’s Foodstreet has a wide array of delectable yet affordable food choices to take care of your hunger pangs after several hours of walking and gawking. So for your kids’ back-to-school items, rest assured Tutuban Center Night Market has them—from ready-to-wear uniforms for elementary or high schoolers, bags, books, notebooks, writing materials, even calculators and computer accessories. The best part is that they are all of good quality and come at very affordable prices. One easy shopping tip from the “veteran” shoppers: it will be a whole lot convenient on your end by bringing your own “to-buy” list to effectively cut shopping time. Doing so allows you to enjoy more of your own night shopping experience at Tutuban Center Night Market when you can finish your back-to-school shopping first and then finally buy items for yourself. Tutuban Center is located along C.M. Recto in historic Divisoria, right at the heart of the City of Manila. For more information about Tutuban Center, visit their Facebook page at www.facebook.com/tutuban.